This city, which once moved rivers to create a new urban design, is now moving a major highway away from its downtown and opening up approximately 20 acres for development. This newly accessible area is within walking distance of Providence’s historic waterfront and commercial downtown. The property in question is known as the Iway surplus land, named for the $610 million federal and state highway project that is relocating Interstate 195 to the outskirts of Providence. The land won’t be available for another year or two, when the road work is finished. But it is already generating considerable excitement among city and state officials, who see a rare opportunity to strengthen the city and state’s economies and to connect neighborhoods to the Providence River waterfront, which has been cut off for years. Brown University and Johnson & Wales University have already expressed interest in buying some of the land. Both universities want to expand their campuses into a neighborhood called the Jewelry District, a warren of streets that the interstate had previously cut off from downtown Providence. As for the rest of the development parcels, which are owned by the state’s Department of Transportation as a result of the construction decades ago of the old highway system, there are expected to be 20 in all, ranging in size from a half-acre to three acres. The surplus parcels are situated between the city’s hospital district, its downtown and its educational institutions, and the vision is for a mix of uses that will foster a new “knowledge-based economy” centered on Providence’s educational and medical institutions. “This is an extraordinary once-in-a-lifetime opportunity for our city,” said Providence’s mayor, David N. Cicilline. The idea is to make Providence more like Boston, which is known for its universities and hospitals, said J. Michael Saul, the interim executive director of the Rhode Island Economic Development Corporation. The surplus parcels, valued at about $60 million, make this a possibility, Mr. Saul said. For the most part, the parcels in question are covered by asphalt or otherwise obscured by the old I-195, the main highway leading to Cape Cod from Interstate 95. That road cut a swath through the southern edge of Providence, creating a barrier between the downtown and a number of neighborhoods. The Iway project is moving the highway split south by about a half-mile, in the process uncovering land that hasn’t been seen in years. In a similar fashion, about 20 years ago the city uncovered the Woonasquatucket and Moshassuck Rivers, which were largely paved over in downtown Providence, and moved the point of their convergence for aesthetic purposes. 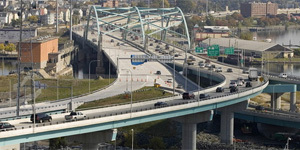 Next year, the old highway overpass will be demolished and the city will begin to create a new street grid, which will better connect surrounding neighborhoods to the waterfront, said Michael P. Lewis, director of the state Department of Transportation. This work will continue into 2011 and 2012, while the state prepares the surplus land for development. In total, the surplus land measures 39 acres, but only about 20 of them will be marketed for development. The remaining land will be used to create new streets and open space. The city has already claimed eight acres straddling the Providence River. This is to become a new city park featuring a sculpture garden and a terraced amphitheater, among other design elements. Construction will begin in another year or two. In addition, neighborhood groups have been lobbying the city and state to take one 1.3-acre waterfront parcel, the site of an abandoned nightclub called Shooter’s, and turn it into a public destination and transportation hub, where ferries could take tourists and commuters from Providence to Newport. This site might also have a shore dinner hall or other restaurant, a marina and open space for festivals and markets. The city’s zoning allows for the development of an eight-story residential building on the site, but opponents say such a structure would be unsightly and squander a valuable public asset. “We don’t want that taken away from future generations,” said Rita Williams, co-chairwoman of the Head of the Bay Gateway, an advocacy group that was formed a few years ago to preserve the Shooter’s site for public use. Aside from the debate over the Shooter’s site, there is general agreement that the remaining surplus land should be dedicated to mixed-use development, with the overarching goals of creating jobs, expanding the city’s tax base and revitalizing urban neighborhoods. This vision was laid out in a marketing study that the state commissioned for the surplus land. That study, by Chan Krieger Sieniewicz, an urban design planning firm in Cambridge, Mass., warned that it would probably take years to develop all of the parcels. “This is especially so given the current economic downturn, which lowers confidence about immediate redevelopment prospects and thus may skew decisions away from ultimate highest and best-use scenarios,” the report states. The report details Rhode Island’s economic woes, which include an unemployment rate of 13 percent, a struggling housing market with a glut of new condominiums in Providence, and a loss of population. Providence’s economy is “deteriorating” and demand for real estate is “very weak,” the report states. As a result, the state should sell sites to Brown and Johnson & Wales as soon as possible to create momentum for future development, the report advises. Brown University wants to buy four acres of surplus land in the Jewelry District, where it already owns property and intends to spend $45 million to renovate an existing building to serve as the new home for its Warren Alpert Medical School. According to Richard Spies, Brown’s executive vice president for planning, work on the 135,000-square-foot medical school would begin next spring and should be completed by the fall of 2011. “We have strong interest in the whole area,” Mr. Spies said of the district, where large jewelry companies once flourished. Johnson & Wales University, which already has a sizable presence in Providence, wants to buy 1.75 acres next its downtown campus to build dormitories, according to the university’s president, Irving Schneider. With 8,000 out-of-state students and only 4,000 dormitory beds, additional housing has become a top priority, he said. Both schools have offered to pay market value for the land, and state and city officials say they want to sell it to them. But any sale to the universities or other nonprofit institutions must be accompanied by agreements to compensate the city for a loss in tax revenue because of their nonprofit status, Mayor Cicilline said. “The interests of the taxpayers have to be protected,” he said. Negotiations on this point are under way. The state’s Economic Development Corporation has been assigned with the task of marketing and selling the surplus parcels. The agency plans to hire a managing director to oversee the disposition of the parcels, keeping in mind the goals identified by the city and state for the land. “I’m hoping out of this we will have a robust knowledge-based economy,” Mr. Saul said.